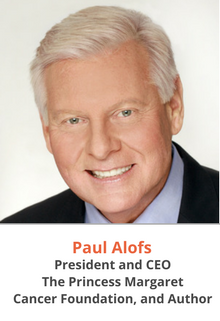 Paul Alofs is President and CEO of PMCF and author of the National Best Seller, “Passion Capital: The Worlds Most Valuable Asset”. He is an award-winning senior executive who has achieved extraordinary success in the retail, entertainment, Internet, marketing services, and social enterprise sectors. As an innovative business leader, Paul ushers in a whole new way of thinking about the very definition of success. Since joining The Foundation, Paul has helped raise over $1 Billion for The Princess Margaret. The Creed/ Belief of The Princess Margaret is To Conquer Cancer In Our Lifetime. The Princess Margaret Cancer Centre is ranked as one of the top 5 cancer centres in the world. His work experience includes General Manager of the 500 North American Disney stores, President of BMG Music Canada, and President of HMV Music Stores Canada. Through his extraordinary career in both the private sector and the social enterprise sector, Paul has earned a succession of accolades. He was named one of Canada’s Top 40 Under 40TM business leaders, ‘Best of the Best’ by his fellow Top 40 alumni, received Outstanding Progress and Achievement Award from the Schulich School of Business, Innovative Retailer of the Year by the Retail Council of Canada, inductee into the Canadian Marketing Hall of Legends, received the Bryden Alumni Award, and many more awards and recognitions. The Princess Margaret Cancer Foundation was awarded “Canada’s Most Admired Corporate Cultures” three times.